You can easily close your eyes and imagine that you are currently on a hot tropical island somewhere because let’s be honest we are having our best summer ever! It’s hot, humid and steamy by day and by night, which makes it not so great for sleeping. But it’s really great for hanging out as we suddenly all get really social and start getting dolled up to go out for the evening. We hang out in bars and chit chat and spend time with friends… love it! 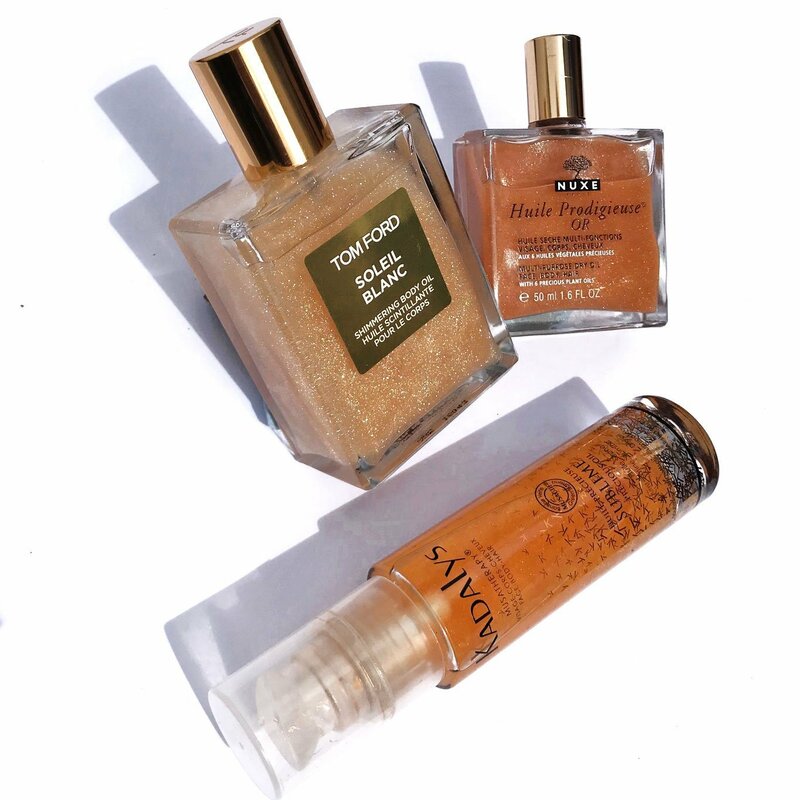 So whether you’re going on a vacation or you having a city staycation this is the perfect time to get those beautiful shimmering oils on your skin! You know, the ones those with a golden glimmer in them so that when you put them on you just sparkle. Now, fortunately, these are all dry oil formulations. This meansyou don’t have to worry about having oil stains on your clothing or about looking like an oil slick. Most of these sink into your skin really beautifully, moisturising and nourishing and just leaving all the little bits of sparkle on the surface. Of course there’s a lot of choice out there but I’ve actually chosen the ones that I use and that I like the best. And as such I don’t have a favourite out of this range because they’re all really good. The only difference between them apart from the price is probably the degree of sparkle. So if you’re feeling a bit subtle and I would say go with the Nuxe, if you want a little bit more drama than go with the Kadalys, and for maximum impact, it has to be Tom Ford. It is designed to be used on the skin and in the hair if you wish and oh yes as with all things Nuxe, it smells lovely with it’s Iconic scent… notes of Orange Blossom, Magnolia and Vanilla. There are also no nasties – free from preservatives, silicone and mineral oils. 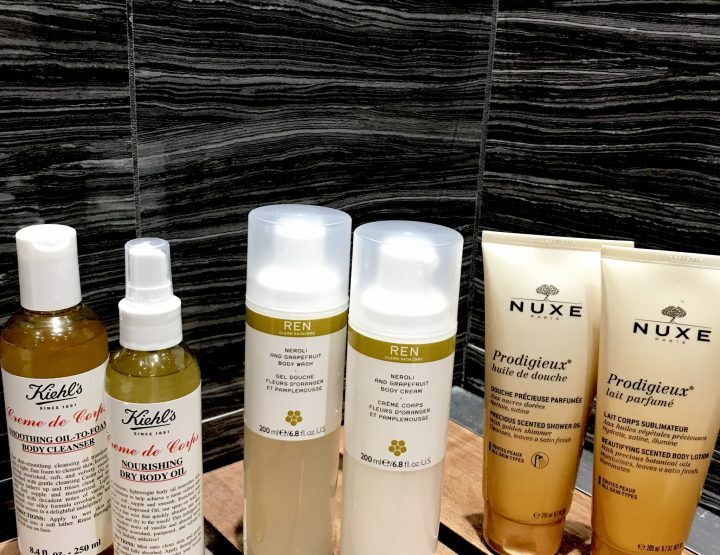 This is another French brand, known for its natural approach to skincare. The golden particles in this lush oil are a bit bigger. It is 97% natural and is a blend of five essential oils. Again this can be used on the skin on the face and in the hair. Yes, it smells lovely, and yes it is free from nasties. When I first tried this oil I think it was maybe at Selfridge’s I was ‘undone’. Even though it was daylight, it just shimmered and sparkled on my skin, probably thanks to the combination of gold particles and shimmering silver particles of varying sizes. I was further undone by the gorgeous scent, which is of the soleil blanc eau de parfume. It contains ylang-ylang, tuberose jasmine and other lush elements. The price, as with all things Tom Ford, wasn’t for the faint-hearted. Then there was the problem of it being sold out EVERYWHERE… I was even further undone as I wanted it to take on my vacation with me and couldn’t find it anywhere! Then the Universe intervened and it was while I was at the airport heading out on said vacation. I popped over to the Tom Ford counter and was asking the guy how soon they might have some in stock, as I had scoured the whole of London to no avail. He said: “we’ve got loads you can have as many as you want”. All was well in my world again and I bought one! It’s a huge bottle and a little goes a long way.